If you would like to book or have any questions, please click on the contact us button. Pick up from your hotel and driven to the ATV Park. Registration plus introduction session. You will be briefed on how to use the atvs, the course, etc. Practice session on the atvs. You will learn how to ride on a gravel track. Then you will learn how to follow a figure of 8 course, oval and circles. Enjoy riding the ATVs on inclines and along muddy tacks. 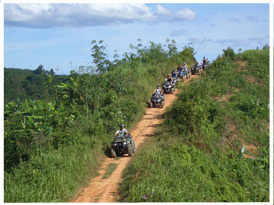 Take ATV tour which follows mini off-road trails through local plantations and tropical forests. Arrive back at the ATV camp, where you will enjoy refreshments before being transferred back to your hotel. Enjoy a fun day out exploring Phuket by ATV. ATV tour offers a fantastic opportunity to explore Phuket by ATV. ATV is an abbreviation of "All Terrain Vehicle" which is a small open motorized buggie or tricycle - designed specifically for off-road use. The rider sits on the ATV and operates the vehicle much like a motorbike. The extra wheels are designed to offer the vehicle more stability, when traveling at slow speeds or over rough terrain. Safety of all riders is of paramount importance, which is why safety measures are exercised throughout the tour. There is a pre-ride safety instruction session, safety course orientation, a guide and a chaser on every ride, support vehicles complete with first aid kits and tools, certified first aid and CPR guides and chasers and communication equipment such as walkie talkies. This tour operates daily all year around. It makes for an exciting day regardless of the weather. Your guide will lead you through the stunning countryside, along paths & trails running through tropical forests, through rubber plantations and unknown beaches. If you would like to experience more adventure, maybe you will be interested in extending your time to the 2 hour advanced tour. On this exciting tour you will be taking more demanding off-road trails. You will ride your ATV over sandy, hilly, flooded and mountainous trails. Then ride on the public road through a variety of local villages.